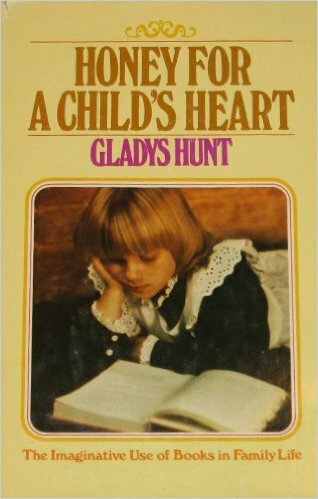 Honey for a Child’s Heart by Gladys Hunt is a book that has been in my life for years. I first saw it when my mother purchased it when I was young. I read it, or skimmed it, as a teen. When I saw that it was available to get at paperbackswap.com, I couldn’t resist snatching it up and re-reading it. This older version of the book does not include advice or comments regarding e-books, because that wasn’t an option back then. But the only way this current information would affect this edition would be the references to dictionaries and methods of searching for out-of-print books. The Internet has brought so much information to our fingertips! She continues, “Yet, tragically, Christians often seem most inhibited and poverty-stricken in human expression and creativity. Part of this predicament comes from a false concept of what is true and good. The fear of contamination has led people to believe that only what someone else has clearly labeled Christian is safe.” I couldn’t agree with that statement more! I grew up in a strict home, but I only notice it now, looking back. During my childhood, I never felt inhibited. My parents did not raise me to fear “contamination”. My mother encouraged me to read all types of literature, nothing too far above my understanding, and certainly nothing filled with bad language or situations, but it didn’t have to be in the “Christian” section of the library. She taught me to overlook a single curse word if the book was true and lovely in its premise. She encouraged me to learn from both the hero and the villain in a story, and to look for symbols in literature. For example, when the animated movie, Beauty and the Beast, came out on VHS (in the olden days! ), a person at my church scolded me for viewing it. “It promotes beastiality!” they said, shocked at my parents’ leniency. But I knew better. The beast was a symbol for a damaged human being, one who was unlovable, until Belle saw something in him that no one else did. When they shared a kiss at the end, he was transformed by her love into a human being once again. That’s how good stories are done; they are told in pictures, or through events, and those events tell us more than all the words of the book combined. I fell in love with the Jamaican teacher in Sweet Whispers, Brother Rush because she did one thing – she showed up at a funeral and signed the guestbook. That one event told me all I needed to know (but had already suspected) about that teacher: she cared. It wasn’t told in the book, it was shown. That’s a sign of good literature. There are a multitude of book recommendations in these pages, and some will be better than others. Mrs. Hunt’s taste and my own are not the same, but she offers a great starting place for one to find their way through the endless world of books. In fact, you could build an entire homeschooling curriculum with just this book and a library card. There is, as I mentioned earlier, a newer version of this book available. But I like this one a lot. The familiar cover reminds me of my youth, my mother, and the wonderful friends to whom she introduced me: Books! I read this book when I first started teaching. Definitely a good one!